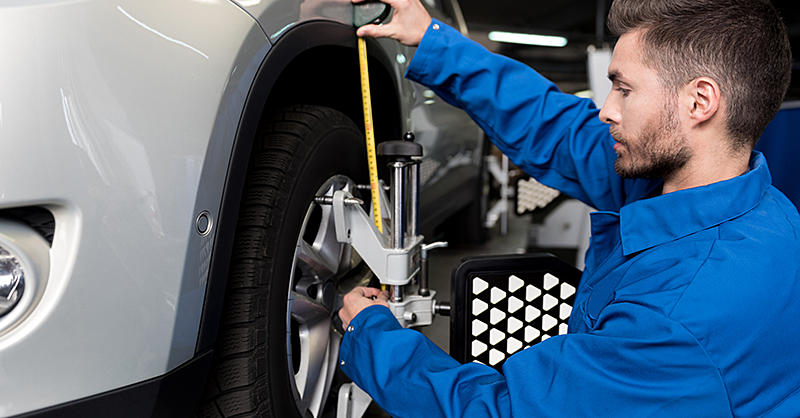 Your car won’t drive straight and true if the wheels are out of alignment. Short term it means you’ll drift out of your lane. Long term, poor alignment will ruin your tires. "Steering-related problems can cause abnormal tread wear and make your vehicle pull to one side," said Tony Molla of the Automotive Service Association. "They could reduce your vehicle's tire life by 50 percent and may be a warning sign for other types of damage." Vehicles fall out of alignment for a number of reasons. Hitting a curb is perhaps the most common. Striking road debris at freeway speeds can also bend parts in the steering and suspension systems. An alignment is the simplest solution, though it may not be the only repair necessary. You may need to replace shock absorbers, sway bar, steering links and rods. Failing to do so may bend the rims and throw tires out of balance once again. What are the signs that your vehicle might need an alignment or suspension components? The vehicle pulls left or right. The vehicle will drift left or right, rather than maintaining the course. Off-center steering wheel. Centering the steering wheel is part of an alignment service. Excessive shaking and rattling. Often indicates worn shocks and struts. Vibration in the steering wheel. This could also indicate a problem with the brakes, so it’s best to check with a trusted service advisor should this happen. Tires wearing thin. 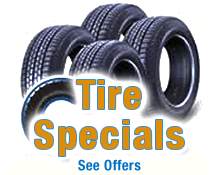 Uneven tire wear often indicates the vehicle is out of alignment. Tire wear around the edges is a common symptom.